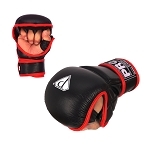 Professional Mixed Martial Arts Gloves | PRO Boxing Equip. As MMA continues to grow in popularity, more and more people are snatching up mixed martial arts gloves. Our professional MMA gloves provide both the padding needed to land a solid punch and the range of motion required to grapple and force submissions. 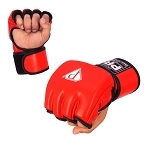 We offer professional MMA gloves in various sizes and in a range of colors, as well. For competition purposes, we carry some of our gloves in both red and blue for easy fighter identification. 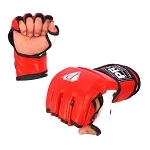 Step into the cage and make your fighting debut with mixed martial arts gloves from the brand you trust. Shop PRO Boxing Equipment’s selection below.